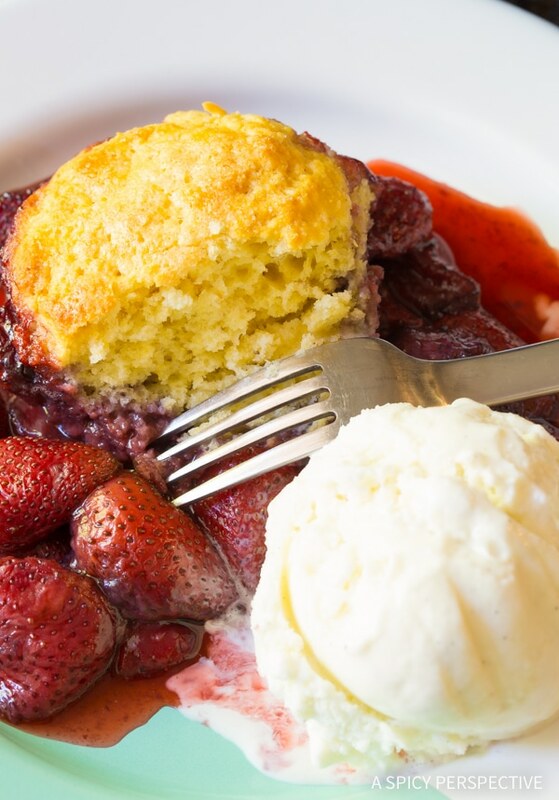 Hot roasted Strawberry Shortcake Skillet Cobbler, a celebration of summer strawberries! We’ve enjoyed a really great strawberry season here in the Blue Ridge Mountains. As with all produce, some seasons are just better than others, based on weather patterns and pests. I’ve been buying local strawberries by the armful, because I know very soon our strawberries will be gone. I’m freezing them for later use, baking them into treats, adding berries to salads, and popping them straight into my mouth… Pretty much all day long. Above all strawberry recipes, strawberry shortcakes and strawberry cobbler are my personal favorites. So today, I’ve combined these two traditional desserts into one dazzling strawberry treat known as Strawberry Shortcake Skillet Cobbler. 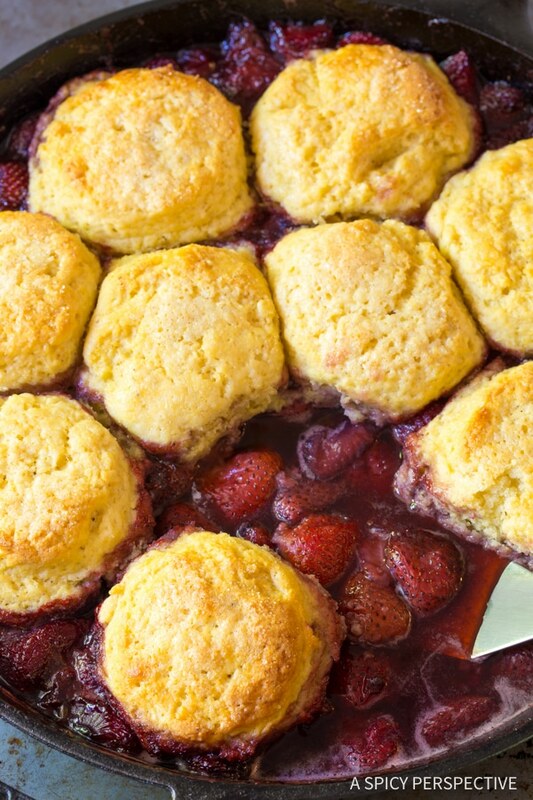 Shortcakes make a wonderful cobbler topping because they sink down into the strawberries, then puff up over the top. I love adding a little cornmeal to my shortcake dough to offer a touch of rustic texture. Roasting the strawberries in the oven creates a rich syrup and gives the berries intense depth of flavor. Start by prepping the shortcake dough and place it in the refrigerator to chill. 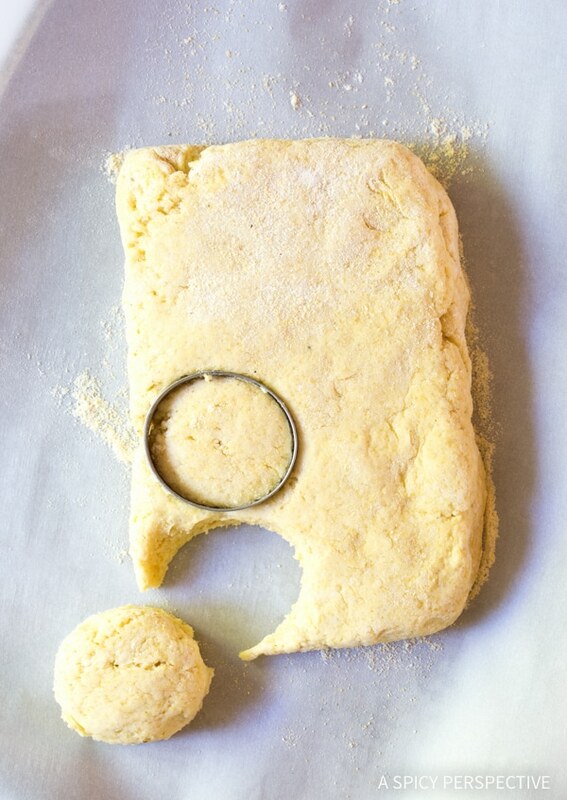 As with all biscuit variations, cold dough with flecks of butter in it creates a light flaky texture. However, it has to go into the oven cold. While the dough is chilling, cut the strawberries in half and place in a large deep-dish cast iron skillet. Add lemon zest, vanilla, and sugar. 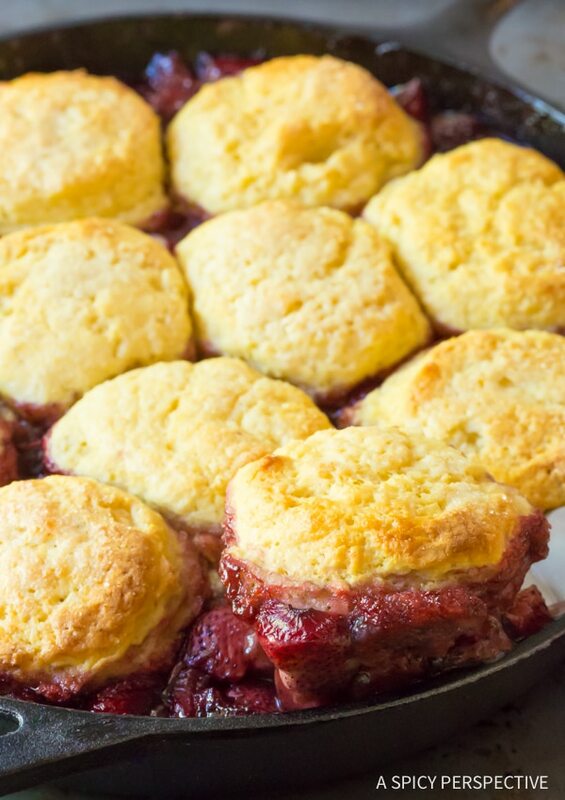 Simmer the strawberries on the stovetop for 5 minutes to give them a head-start on the shortcakes. Then cut the shortcake dough into rounds and arrange the disks over the surface of the simmering berries. 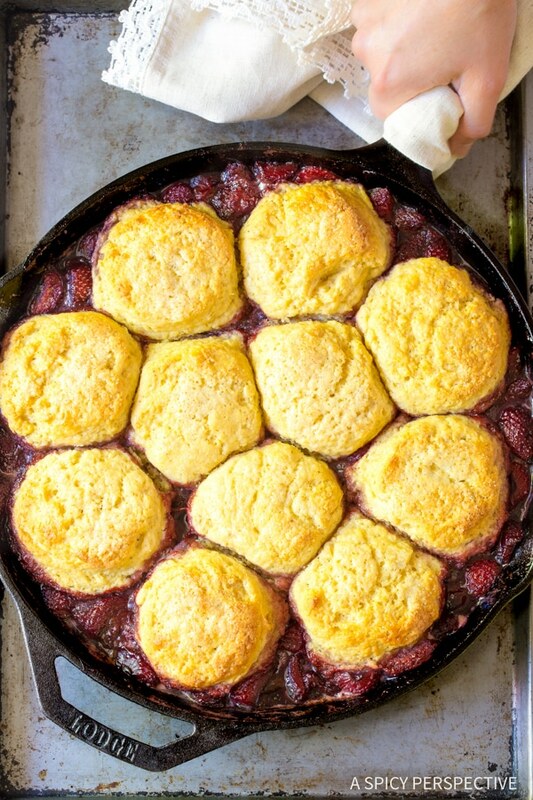 Place the entire skillet in the oven and bake until the shortcakes are puffy and golden. In the oven, the shortcakes will first drop a little into the berry filling. Then they will rise up and bloom over the top of the strawberries. The exposed strawberries around the edges roast to a dark ruby color. 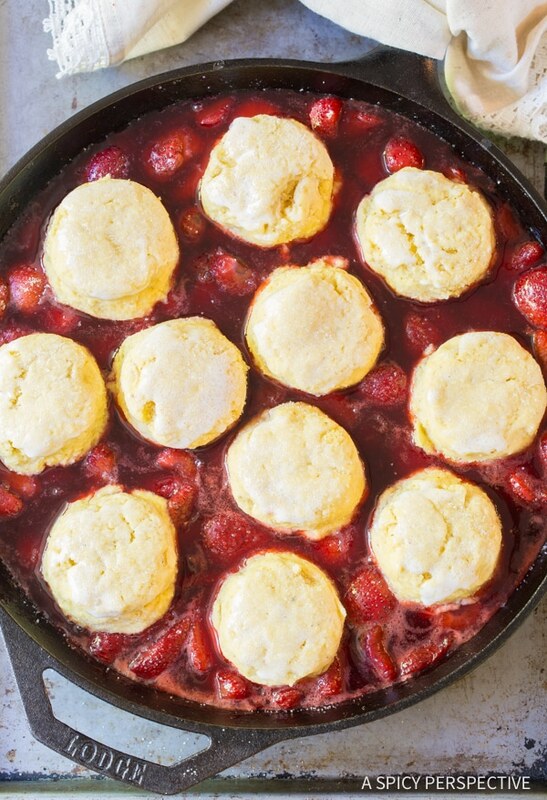 Strawberry Shortcake Skillet Cobbler is pure berry perfection. 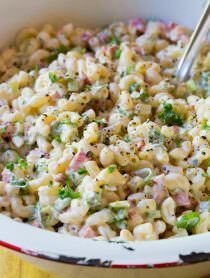 If you are looking for a twist on a classic summertime treat, give this a try! 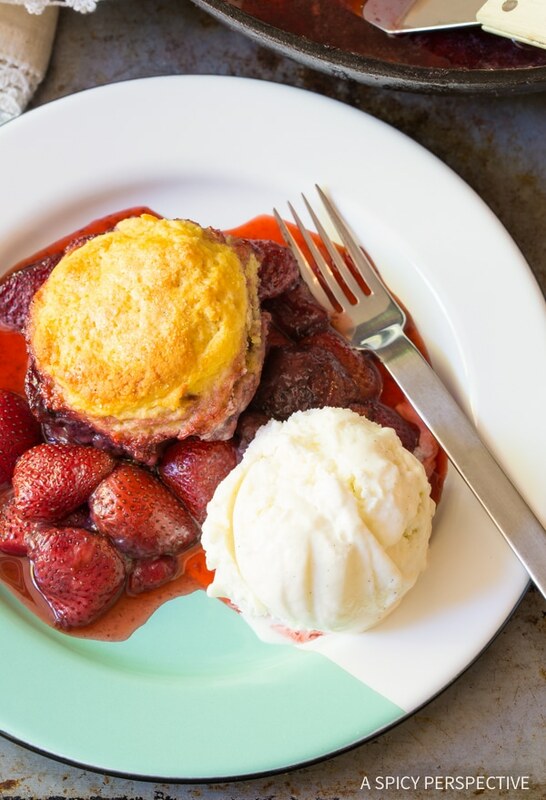 A roasted strawberry cobbler, with sweet biscuit topping! This simple summertime treat is easy to make. Preheat the oven to 425 degrees F. For the shortcakes: Place the flour, cornmeal, sugar, baking powder, salt and butter cubes in the food processor. Pulse until the mixture looks crumbly. Then pulse in the eggs and buttermilk, until the dough forms a ball. Wrap the dough in plastic and refrigerate. 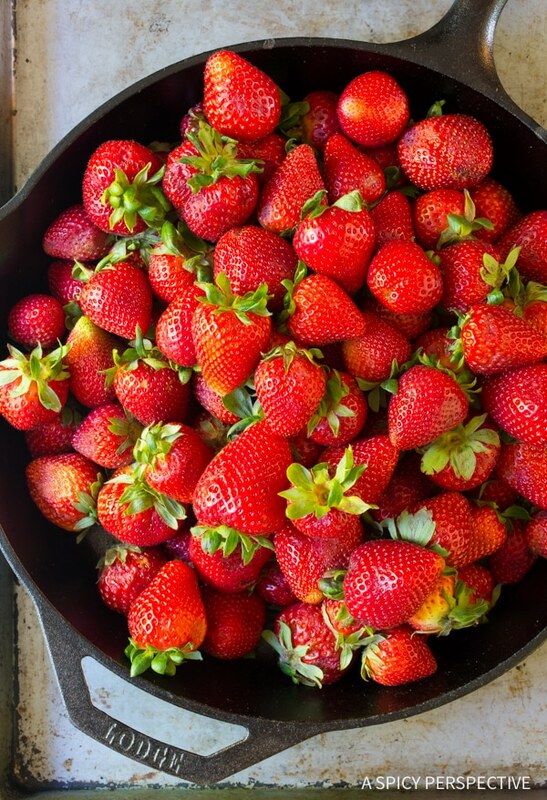 Prep the strawberries and place in a deep-dish 12 inch cast iron skillet. Add in the sugar, lemon zest, corn starch, vanilla and salt. Place over a burner and set to medium-high. 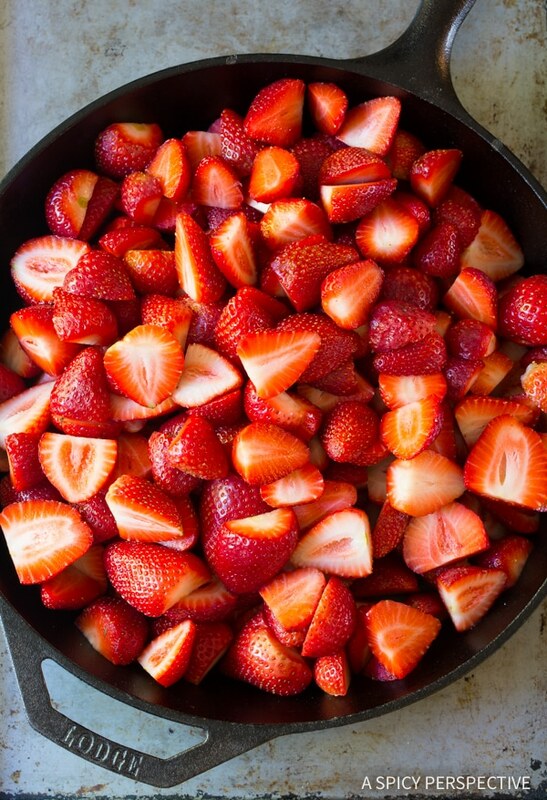 Simmer for 5-7 minutes to melt the sugar and start breaking down the strawberries. Stir occasionally. Arrange the shortcakes evenly over the surface of the simmering strawberries and immediately move the skillet to the oven. Bake for 20 minutes, until the shortcake tops are puffed and golden brown. 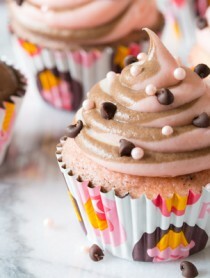 Serve warm, with a dollop of whipped cream or vanilla ice cream. 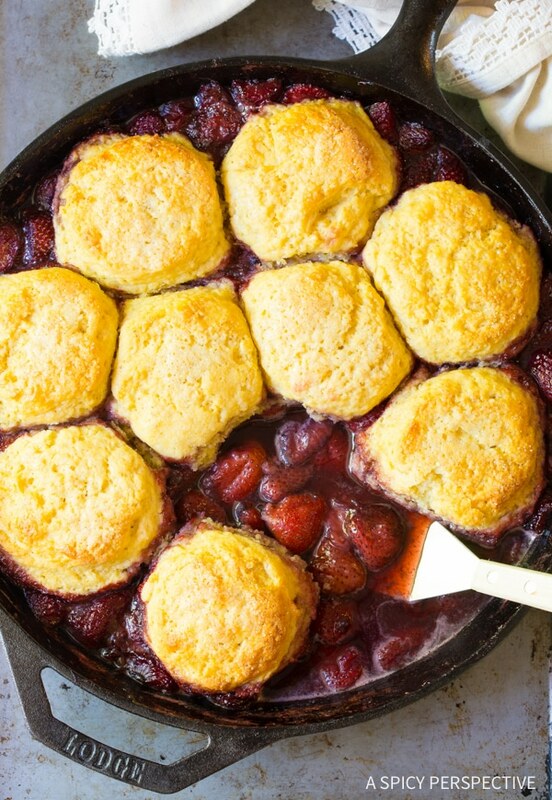 NOTE: If you do not have a deep-dish skillet, pour the simmered strawberries into a 12-inch ceramic baking dish and top with the shortcakes before baking. 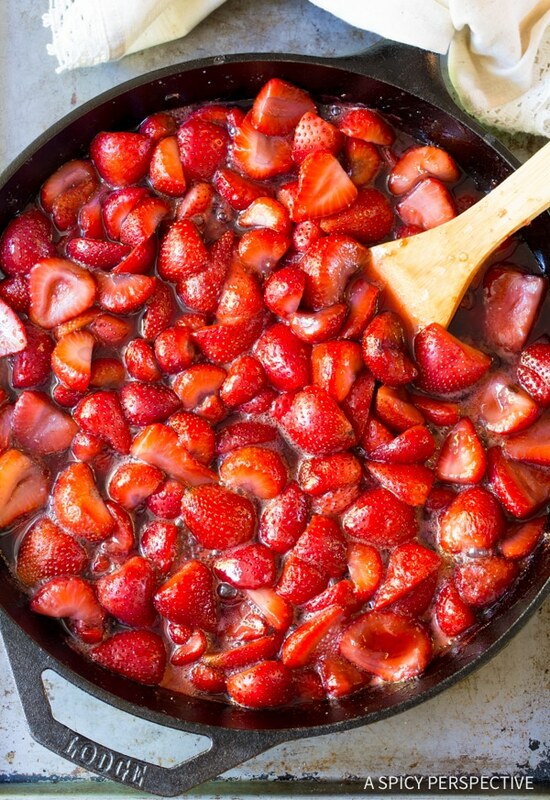 If you use a shallow skillet, the strawberries juices will bubble over the edges and burn in the bottom of the oven. Hi Somer: If I wanted to make this in a 9×13 glass oven casserole dish do you feel I should double the recipe for both the strawberries and biscutis? 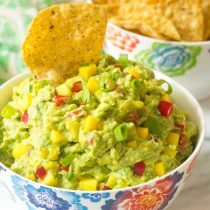 I am feeding a crowd so I want to make it easy. However I don’t want to make it so t hin on the strawberries that they burn. are you serious? Within an hour of seeing this, I went to the store for strawberries. Of course, I cheated and used the Grand Biscuits from the dairy isle instead of making homemade shortbread. It was awesome!!!!!! I can only imagine how much better it would have been if I made real shortbread. Sommer, you are the bomb!! !